Kelsey is absolutely phenomenal! She is so fun, positive and professional to work with. Her clear communication, attention to detail and flexibility were just some of the qualities we loved about her! 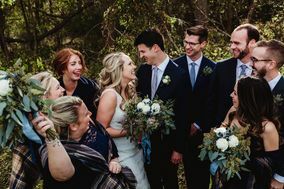 Booking Kelsey for our wedding was the best decision we made and we will definitely keep her in our repertoire for future photo-worthy occasions. I was so pleased with the service and the product that we received from Kelsey. We were so lucky that she was flexible on location and traveled to us, not just for our wedding, but also our engagement photos. The booking process was so simple, communication was a breeze, and working with her was a joy each time we met. When shooting, she knew when to give direction and when to stand back and let things happen. Kelsey and her husband were able to use their drone on our wedding day to capture some of our favorite pictures of our wedding venue and of my new husband and I. We are so happy with our final gallery, and would highly recommend Grey Spoon to anyone. Choosing Kelsey Addy of Grey Spoon Photography to capture my wedding was one of the smartest decisions I made during wedding planning. She did both my engagement photos and wedding photos, and I could not be more thrilled with how everything turned out! To begin with, Kelsey is one of the sweetest, friendliest, and most down to earth people you will meet. When we first met for our engagement shoot I was nervous because I had no idea how to pose or position myself, and I was going to be spending the next hour or two with a complete stranger. Kelsey's friendly and professional demeanor immediately put me at ease, and I felt very comfortable with the directions she was giving. She was so friendly and it meant so much to me that she took the time to really get to know my fiance and I during our shoot. At that time I knew we picked a great photographer. I didn't have a whole lot of help planning my wedding, and I really appreciated Kelsey's guidance throughout the whole process. She even sent my husband and I something through the mail to congratulate us on our engagement, which was a very thoughtful touch. She was very professional, organized, and quickly responded to any questions I asked. I found her website and online planning questionnaires very easy to use. Additionally, I felt her prices were very reasonable compared to what else is out there. We did look at some cheaper photographers who did fine work, but I felt they did not capture the warmth and details like what I saw in Kelsey's portfolio. I feel that her prices are a good bargain for the quality of photos she delivers. I could go on and on about how happy I am with Grey Spoon Photography, but I think you should check out the website for yourself (especially the sunset pictures--to die for!). I could not be happier with how well our engagement and wedding photos turned out. If you pick Grey Spoon you will not be disappointed! We are so happy that we used Kelsey at Grey Spoon Photography for our daughters wedding!!! Kelsey was always there to captures every smile, laugh, kiss, glance and emotion and she did so beautifully! Kelsey gets the job done, but does so naturally and makes it all fun!! She knows weddings in and out and did not miss a thing!!! Kelsey contributed greatly to making the day special and truly memorable!!! Kelsey took our son & daughter-in-laws wedding photos. She was fabulous. Easy to work with & very in tune to our needs. She was able to capture so many moments I didn't even know were going on. I appreciate her organization & attention to details. Kelsey did all our photos for our wedding ceremony before and after and at the reception! She was so amazing to work with! I had shown her ideas of pictures I wanted to do and even tho I didn't remember all of them she did! She really made my husbands and My special day really special! Looking at the pictures I wouldn't of wanted anyone else to do them! They are breathtaking photos! Kelsey is amazing if your thinking about using her do it, cause she will work with you every inch of the way! Kelsey did a wonderful job on our wedding photos and she was wonderful to work with! Very flexible and accommodating! She was so excellent at capturing all the facets of our special day, beginning to end! They helped make the day worry free and pictures were so beautiful!!! Working with Kelsey was amazing. She made sure for our engagement and wedding photos that she knew the look we wanted. She nailed all of it! She has eye for detail. Kelsey did our engagement photos 4 years ago. We love them! She has only gotten better. We highly recommend Grey Spoon Photography.